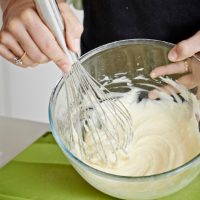 Homemade mayonnaise should be kept chilled and eaten within 24 hours, as it contains uncooked egg. It’s not suitable for pregnant women, young children, the elderly or infirm. 1. Put the yolks and lemon juice in a bowl, season and whisk using a balloon whisk. 2. Slowly add 2 tsp oil and whisk vigorously to incorporate. Continue to add the oil slowly in a thin stream, whisking constantly, so the oil is emulsified. (Alternatively, use a blender, drizzling the oil through the lid as the blender works.) Keep whisking or blending until all the oil has been incorporated and you have a smooth, creamy and thick sauce. Add a little warm water to loosen if necessary.